Allen County Economic Development Group CEO Jeff Sprague discusses the We Care at Work initiative that helps combat the drug epidemic and improve workforce development in the region Thursday during “Repopulating our Workforce: Labor Initiatives to Address our Drug Crisis” event at Ohio Northern University. ADA — Mentorship and drug prevention are some of the solutions to successful workforce development and tackling the drug crisis, according to Jon Cross, president and CEO of the Hardin County Chamber and Business Alliance. 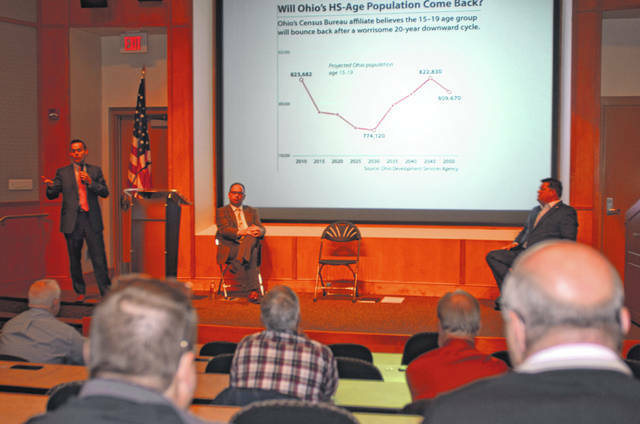 During a forum called “Repopulating our Workforce: Labor Initiatives to Address our Drug Crisis,” Jon Cross, Dan Sheaffer and Jeff Sprague spoke on how to improve the labor force and how the region is tackling the opioid crisis at Dicke Hall Forum Thursday at Ohio Northern University. Students in elementary through high school in Hardin County are partnered with mentors to help tackle the drug epidemic. Hancock County has established Raise the Bar, a workforce organization in partnership with United Way that helps build the culture of success and build the workforce pipeline through education, said Sheaffer, project specialist with Findlay-Hancock County Economic Development. The Pre-K Experience is the program for Pre-K age children to prepare them for kindergarten, the Leader in Me program is for students K-5 to learn social and soft skills and Dream it Do it is for middle school students to learn more about career exploration and career interest. “Teaching these skills are very important when it comes to building towards culture of success,” said Sheaffer. Hancock County is focused on career planning and employment as well as recruitment of young talent back into the area. Allen County has tackled the drug crisis by exploring sources internally and working collaboratively across different disciplines, according to Sprague, CEO of Allen County Economic Development Group. Through a partnership with the Mental Health & Recovery Services Board of Allen, Auglaize, and Hardin Counties, Lima Memorial Health System and Mercy Health-St. Rita’s Medical Center and OhioMeansJobs Allen County, they created the We Care at Work initiative. Employers and employees learn more about how to better deal with the drug epidemic and provide help to those struggling with drugs. Allen County has also engaged law enforcement to see what the pipeline looks like and how to eliminate the drug epidemic.